When you get this error message, that mean Barnes & Noble account info you input isn’t correct, this is tutorial how to find correct info for a book. Your Name: This is the name used by Barnes and Noble to generate your encryption key. Seemingly at random, Barnes and Noble choose one of three places from which to take this name. Most commonly, it’s your name as set in your Barnes & Noble account, My Account page, directly under PERSONAL INFORMATION. Sometimes it is the the name used in the default shipping address. If these names are different in your Barnes and Noble account preferences, suggest try them one by one. Credit Card#: this is the default credit card number that was on file with Barnes and Noble at the time of download of the ebook to be de-DRMed. Just enter the 16 (15 for American Express) digits. Credit Card Number don’t need any more after NOOK Key created. 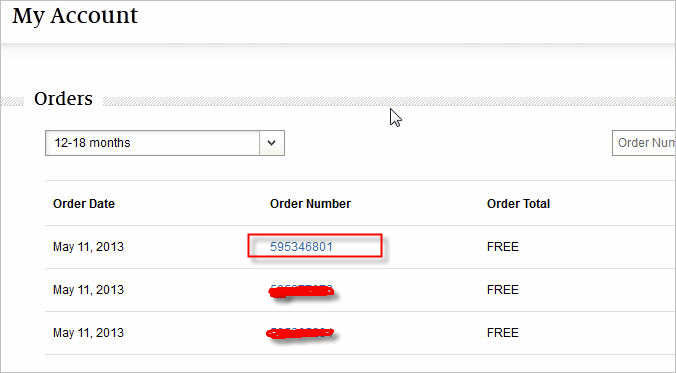 **if you don’t find billing address in order, that mean it is default address. Over 2.5 million titles-new releases to bestsellers. Sample FREE. Most $9.99 or less. Get them instantly via Wi-Fi®- usually in under 10 seconds. NOOK Daily Find™ brings you a great book at a great price, plus a weekly Free Fridays™ title. Ultra-responsive 7-inch multi-touch screen displays 16 million colors ultra-bright. Specially designed for remarkable clarity and minimal glare so you can enjoy the ultimate reading and entertainment experience. Enjoy the best apps. Games like Angry Birds & SCRABBLE©. Essentials like Taptu & MyCast Weather. Favorites including Epicurious & Drawing Pad. Plus pre-loaded Sudoku, Crosswords, Chess & Pandora®. Get expert recommendations from our 40,000 booksellers, plus personalized recommendations based on books you love. And any time you’re reading, just tap the Discover icon for ideas on similar books to read next.